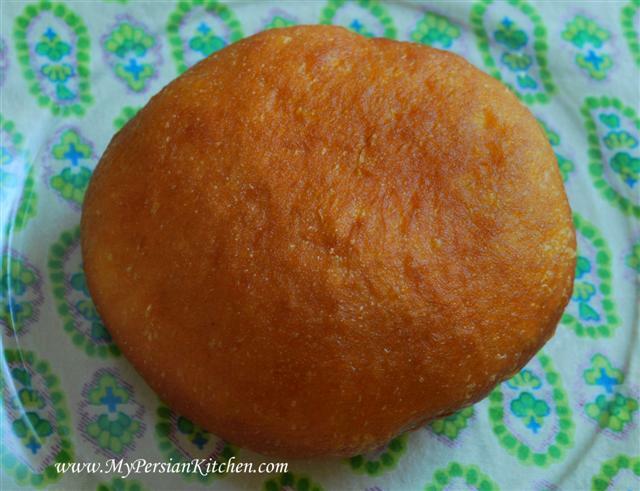 I bet you anything that if you ask any Iranian how they feel about Persian Pirashki, they will start salivating. I personally LOVE Persian Pirashki. There are a few dishes in the Persian Cuisine that were originally Russian. The fact that we have some similar dishes is no surprise at all given the history of our region. Another reason is also the fact that some Iranians were sent to Russian boarding schools. In fact my own maternal grandmother and her siblings and cousins attended boarding school in Russia for a good few years. I loved my grandmother’s cooking and wonder if she got some of her inspiration from her childhood years spent abroad. 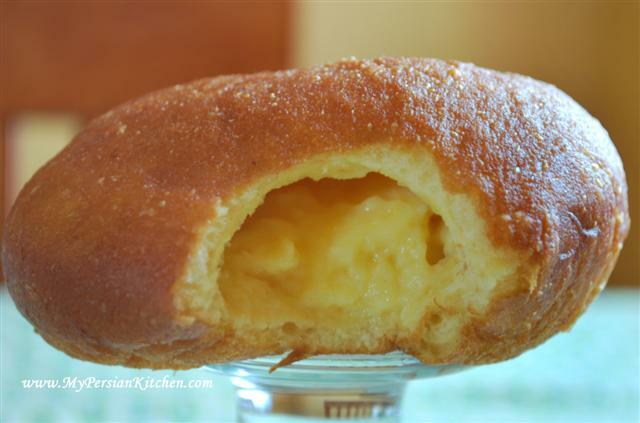 Come to find out that Russians don’t make Piroshki with custard like we do. “There is no such thing as sweet Piroshki” Mela said with a stern voice. Ya know, like what are you talking about? Have you lost your mind? Oh boy! So I told her that’s how Persians eat it. Poor Mela said with complete bewilderment and disbelief, “how can Piroshki be with custard?” Like what have you crazy Persians gone and done with our Piroshki? And I laughed and laughed! Here is my conclusion about this subject matter. Persians stole the idea of Pirashki from the Russians and made it into their own by doing what the Russians didn’t think of doing: adding a delicious custard. Frankly, I say it’s genius. Don’t get me wrong, you have not lived until you have Mela’s cabbage Piroshki or her pancakes for that matter, but there is something so incredibly delicious about these Piroshkis, see for your self! You take a bite and there it is the deliciousness of the custard. So delicately sweet and smooth! It just oozes out of the Piroshki. YUM! If you live in LA, do yourself a favor: stop by Jordan Market and get yourself one of these. Make sure to stop by in the morning when they are still nice and warm. Hi Mela! you believe me now??!! Does anyone have a recipe for the dough? The Persian dough that is! I absolutely love Persian cuisine! I learned how to make a few dishes but had no idea about this one that you just described! Looks heavenly indeed! Actually, in my humble opinion, I would look for inspiration in the French repertoire. 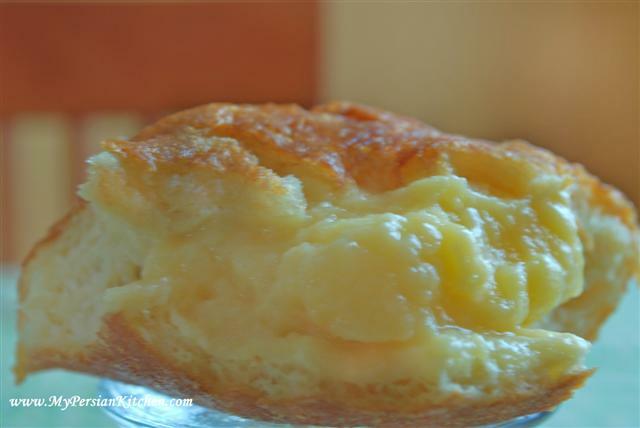 The French have a bread similar to the one you just described that uses brioche dough (with yeast in it) and has a filling of custard made of crème patissière, or pastry cream. It is a recipe from Brittany, I think. In any case, it looks just like this one, and they sprinkle the top with powdered sugar. thanks for the suggestion, I will most definitely look into it! The French indeed The French most definitely know a thing or two about such things! Have you ever visited the Armenian eating establishments in Glendale. Ghannady Shahreza has excellent pirashki among other thins and Paradise Bakery serves fresh hot Armenian food on demand. Maybe we need to go on a field trip there one time. No, I have never heard of them before. I don’t go to Glendale often, and the few times that I have gone there, to be honest I made a quick stop at Porto’s! I’d go anywhere on a field trip with you Moujan khan!!! Please let us know how to make these. Oh la la! Here is yet another recipe to look for. They look delicious, what’s in them? No idear…It has a been a while since high school…I know it was sweet and breakfasty. My thought is that it is the middle eastern response to donuts but I know I may get arrested by a cop over this comment. I say a lemon custard would be a good start. Have no fears Hungry Tiger, I called my trusted Armenian friend and he is going to ask his mom for the recipe! Hungry Tiger, Do you have a recipe for Ponchik? I have not had one for 35 years. Then add next 3 and combine them well. Add the flour 1 cup at the time, and mix well, you might need more or less flour. Kneed for few minutes (The dough should be smooth and not sticking to your hand) and let rest for an hour. Mahnaz Khanoom, you are my HERO!!! I am definitely going to make it! I made a mistake in my post. The second group of addition has 4 ingridient and i said 3, sorry about that. Also, the dough should be fried first and then be filled with custard. Thank you SO much Mahnaz khanoom! Thank you Vivi! We will definitely try your recipe! The sweet pirashki is delicious, but sadly in Iran whenever I used to buy them 9 out of ten times it would be stale and hard. I actually have fond memories of the handful of times as a kid I managed to get fresh ones from the shop. By the way, for those wondering ponchik is basically the same thing as the sweet pirashki posted here. The filling is the same as far as I can remember, except the bread is a tiny bit more dense and crusty at the edges unlike the pirashki which is all soft. Both are good… now I’m so hungry. I grew up in Iran , and I had piroshki filled with meat everyday when I was at high school. to be honest I think thats how most persians eat it , never had a sweet piroshki , I think they call it sth else the custard version of it I mean. You mentioned Super Jordan on Westwood, but have you tried Rex Bakery/Ghannadi. There two locations ( West L.A. & Valley), and are owned and operated by a pair of very nice sisters. I live in Iowa, and when I visit family in L.A., I HAVE TO! stop there. They make the Piroshki with ground beef or custard. They run out fast because they are so tasty. So call ahead. They also make a delicious Barbay bread. Sorry for being so long winded. Ciamak, ooohhhh I don’t think I have heard of them. I am going to HAVE to go check them out now!! Thank you for letting me know!!! Enjoyed meeting you and taste the Sabzi Polo ba Mahi, Mostokhiar and Kuku Samzi. I have a recipe similar to Vivi for Pirashki and made them several time and they turn out beautifully. YUM!! Hope you enjoy your stay on Maui. Aloha Mr. Nabavi! Thank you so much for coming out last night. It was great meeting you! Do you have recipe for sweet pirashki? Hello! its my first time to check your site.i was actually looking for a “persian pirashki recipe”and stumbled into your interesting site.I am a foreigner who lives in Iran for many year.i have tried all your wonderful meals.now i can make the “intruiging” Pirashki that i see all over Iran.thanks for your recipes.and more power to your site. Maria, I am so glad to hear that you have made many of my recipes! Have fun making Pirashki!!! malakeh, the dough for the sweet pirashki is different. I have not tried it yet, but stay tuned! Hi.i have very good sujestion about cake and cokie. 911 S. Glendale, Ave 818.240.9111 for the sweet ponchik and a freshly brewed cup of tea. Reading what u wrote about pirashki took me back to my school days in iran.. there was a shirini forooshi called ‘Sahar’ in Tajrish – Tehran, Sahar is now huge with other branches every where. But back in the days where they had just started up they used to make these awesome pirashkis that my dad or grandad used get for us after school. They were so yuum and exactly as u just described it. God I soo miss it now :p The custard wasnt the same custard you get in the west though, it was nicer, creamier and tastier. Mehdi, I have to visit Georgia!!! I am going to look into the Polish style!